Hello all, you may be surprised that this sub forum has some life to it, but here I am, posting another art challenge. 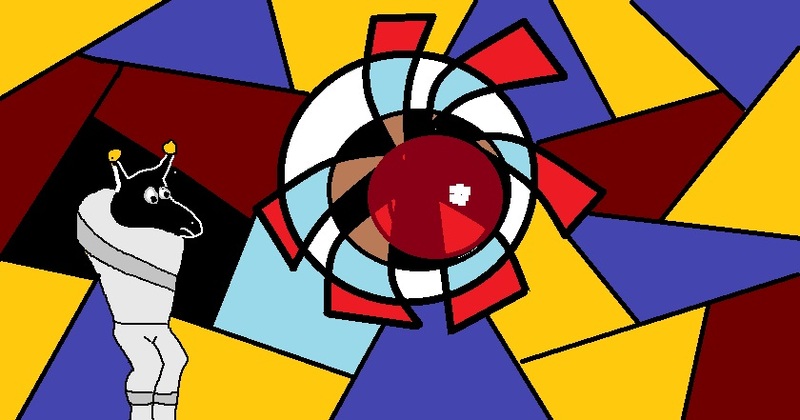 As you can tell from the title, this is an Abstract Art Challenge. And the topic of inspiration is: Draw an ugly thing. You could take this literal, but if you want a good chance at winning, I would draw something outside the box like drawing a political statement, hunger, cancer, or whatever you want. Try to come up with your own ideas. Now I know what some may be thinking, "I'm not a good artist, I'll never win." Well STOP right there. You don't need an ounce of talent. The winner will be selected out of original thought, execution, and general greatness. (wouldn't kill to have talent though ) Kidding. HOWEVER, your submission but be an abstract piece of art. This means NO sketches. If you do submit a sketch, I'll still consider it, but the chances of winning are lowered. Just because I said to draw an ugly thing, does NOT mean it can be inappropriate. PBA rules still apply to this contest. Keep it PG-ish. Do not steal the artwork that you post. It's plagiarism, and I won't take it lightly. I'll be the one judging this competition, and I'll comment when I'm ready to choose a winner. Recommend this to your friends. Anyone can join, including staff or banned members. Edit: The entry must have your username on it. It can be made by hand or digitally made, either one. Submissions (PLEASE MAKE SURE IT'S AN ABSTRACT PIECE OF ART. If you don't know what it is, google it. You can only enter once, make it worth it! BowWow_: http://i.imgur.com/QfS8v9T.jpg WINNER! Send me a forum PM when you next login and check this. I completely forgot to post the winner, and you haven't been on in 80 days! That is the absolute most beautiful thing on the internet. My abstract piece is called "overfishing". It represents the loss of life in a vast yet empty ocean that was plundered by greedy fishing vessels for even greedier humans. Despite the push for conservation, the power of currency prevailed and what was once a reef of rainbows were crushed together into a lifeless seafloor drained of color. Humans are blind to the consequences of their own desires and it wasn't until it was too late that they realized that when they continue to take and take, there will eventually be nothing left. I am not 100% serious with this submission. Last edited by Drakon on Fri Mar 14, 2014 2:17 pm, edited 1 time in total. That image is from the internet, and rules clearly state no plagiarism. You have encountered a wild Roserade! Due to the short amount of accepted applicants, the prize will not be a donation, but there will still be a great prize Sorry bout it. Like for this topic .